The album is as mature as its predecessor, Delirio Específico, though more relaxing. We have interviewed them. There’s always a story behind the name of your albums. What’s behind Chill Aquí? We wanted to make a record for people to feel more relaxed. The title comes from a song we started writing which we wanted to be fast but ended up being slow. We said it was a power chill song. Then Chill Aquí sounds good to us; it’s a mixture of the fictitious name of a German shaver and the feeling of being comfortable in a space. The song ‘Chill Aquí’ seems to talk about the opposite, about leaving a city because you’re no longer comfortable in it. We believe the Chill city is something that you also build. We want the álbum to help listeners find their own space. It could be said it’s a self-help álbum. The song talks about the feeling you have when you want to leave the city you live in because you’re not comfortable living there anymore. It’s the perfect excuse to move to Berlin. The song invites you to think that maybe when you think about doing that you’re not really feeling good about yourself and that you most likely won’t wherever you go. Desayuno Continental was fresh and without prejudices; Delirio Específico was a step towards maturity as a band and Chill Aquí is a mixture of the two. It’s easier than your previous album but it also sounds adult. Do you have the same feeling? We wanted a fresher feeling. We felt Delirio Específico was perhaps too sophisticated. It’s interesting as an album, but not as nice as our first one.Chill Aquí is made with lots first takes and loops. All songs can be listened to relaxingly thanks to the loops. Working on those repetitions is also easier because then songs don’t need so many changes. It’s is also easier production-wise? Our previous album was produced by Pablo Díaz (El Guincho), and it went well because back then we wanted something more complex. For Chill Aquí we’ve worked with Aleix Claveria, one of the members of Extraperlo, but we’ve all participated in the process a bit. The cover illustration is the work of English artist Jiro Bevis, it was mixed by Al Carlson (Ducktails, Part Time, Peaking Lights…) and mastered by Joe Lambert in Nueva York. Are these symptoms of a future internationalization? In a way it is. We wanted to work with foreign people to get something different. The cover illustration was a bit more by chance. He’s friends with Aleix. We were looking for a 70s collage and we liked his proposal. It’s a very masculine and speedy cover that expresses the opposite of the title, which expresses a calm feeling. You toured in South America with your previous album. Are you planning on going back? Yes, we had a pretty good reception and it’s a territory we’d like to explore. Facebook is very good to know where fans come from, and almost half of them are from Latin America. What have you been listening to lately? You’re so many I’m sure you’re record collection must influence a lot you creative process. 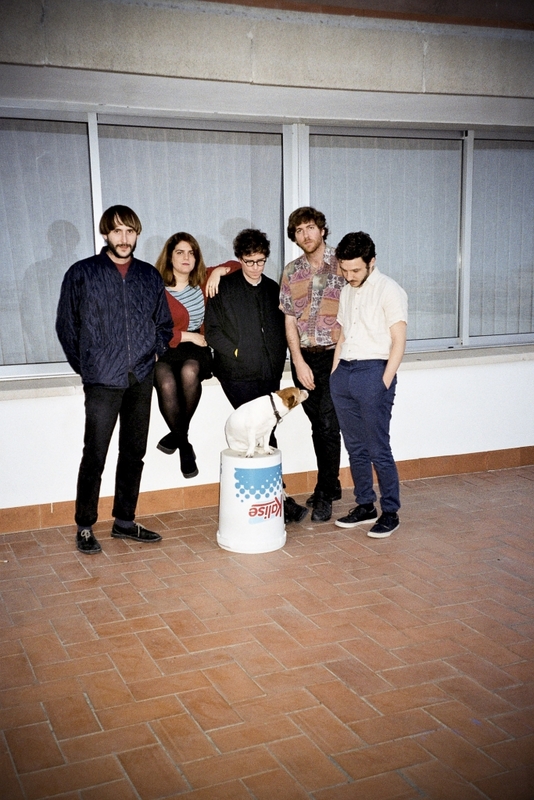 A little bit of everything, from Italian singer-songwriters like Lucio Battisti to more experimental ones like James Ferraro to Blood Orange or contemporary bands like Haims or Ducktails. We also listen to 70s soft rock. Being five members in the band, is there conflict sometimes? Of course there is, but we always end up finding a happy medium. We’ve spend two years making this album, partly because the way we write songs is not fluid, I guess it’s due to our perfectionism. There’s a lot of work on what we do. We’re not the kind of composers who look at the moon and get inspired. We want to do something interesting for our audience, not just anything that comes up at a given moment. Who’s interested in that? Alba and Borja run Canada’s publishing department. Releasing your stuff on the label you work for is good or bad? The good thing about it is that we have no pressure from the studio or the record label, we enjoy a lot of freedom. The bad thing about it is that we always fall victims to our own deadlines; we really have to be serious with them. We hang out a lot on Paseo de San Juan. For a good meal we go to Chicha Limona (C/Paseo San Juan, 80), Adonis (C/Bailén, 188) and Taberna Viti (Paseo San Juan, 62). We go Snack 55 (Paseo San Juan, 55) to drink beer. For a creepy end of party, we go to Date Un Capricho (C/Bailén, 151), a quite decrepit yet fun place. After rehearsing we go to Kai Xuan (C/Roger de Flor, 74) and if we want to go crazy we go to Los Piratas (C/Ausiàs Marc, 157). For cocktails, we still love the Negroni (C/Joan Costa, 46). Borja: I wouldn’t ban anything, maybe some Twitter accounts.